I joined Origin BB Fibre 40 \10 from Plusnet in May 2017 simply becaause they were the best value for money. Im aware of their bad rep but figured it was worth a gamble. Since they do not have a forum for help i figured ill post here instead. I have been running a BB Quality Monitor since i joined, however this past couple of weeks my monitor is picking up high latency & spikes in packet loss, resulting in the internet being a bit sluggish at times with some intermittent disconections. I emailed Origin with a link to my graph, speedtests & router stats but no response. So i phoned tech support & got fobbed off, he insisted on me downloading some software to analyze my connection however i only have an android tablet device & the software requires windows so he appeared unwilling to help. When i first joined in May 2017 i did have some spikes of maximum latency & a snall amount of packet loss for a few months, usually during peak times which i figured must be down to congestion to which i submitted a ticket but got nowhere with tech support so gave up as speeds appeared to be unaffected. Modem stats are limit with the TP Link vr2600 router (0db line attenuation upstream is a bug), error packets can rocket esp on the downstream into thousands but this could be a firmware bug. It had recently disconnected \ reset three days ago which is why the error packets are so low at the moment. If this was classical congestion as an issue then would expect things to be better in the 1am to 5am window, the timing of the start is in line with the busy time of the day. It is possible they have some users who start a succession of large downloads that carry on it the small hours. You have confirmed that you don't have any devices doing silent stuff like upload/download to cloud photo backup? What have you got on your wired LAN, I remember seeing something like this with some sort of loop on the LAN. The only devices i have connected via wifi is a Samsung Tab S tablet & three android phones with no uploading \ downloading of any significance other than the odd apps updating, nothing that should cause that kind of latency or packet loss. As you can see from my graph it suddenly resolved itself between 20th August to 20th Oct with no changes to how my devices are connected or the configuration of the router. All i have plugged into my router is whats needed for it to work, telephone cable from socket to router & power cord. I dont believe its anything to do with my set up but an issue at the exchange, cab or the telephone cable running to my socket. This is why i asked tech support to send out a BT engineer to test it but he fobbed me off, saying if the engineer found no fault then i would be charged a fee. Seeing exactly the same as the OP. On 25th. September we had to re-connect using a new ID and password since when things have not been good. As a starter, the line was capped at 39999 although we are on the 80/20 package and achieve about 70Mbps in normal circumstances. Managed to get through by phone to Tech Support (it was about 01:30) and the cap came off within 36 hours. However, since 26/10/17 speeds have been all over the place. Typically the weekday download speeds fall off the edge of the cliff from about 17:00 to midnight with the drop being from about 10:00 to midnight at the weekends. At the same time pings to various sites I use for reference rise to about double the normal values. 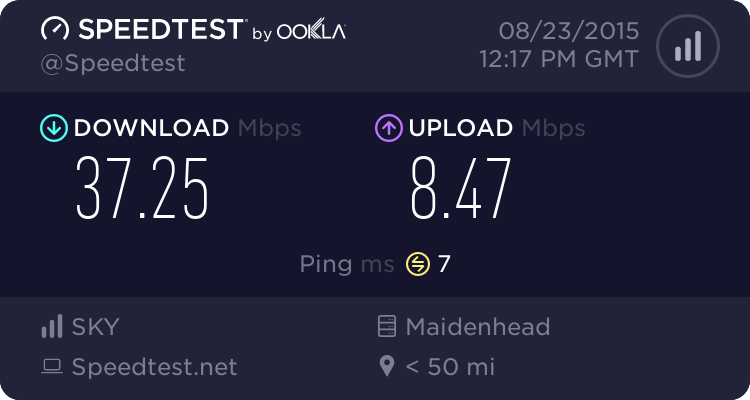 I have an open ticket with Origin re the speed drop and have submitted various speed test results using http://www.supportal-test.co.uk/ which apparently feeds results directly back to their supplier. These tests have been taken with WiFi turned off and only my laptop connected by ethernet cable. The results include some tests with single figure download speeds. Mr. Saffron will also be able to see the large number of TBB speedtests I have taken recently (by ethernet cable but with the WiFi enabled on the router) which show the huge disparities over time (and also the big gap between single and multi-threaded downloads at certain times). I now await feedback from Origin about what they intend to do to alleviate the problem. I am not a technical expert but would guess that the symptoms all point to some sort of congestion. In those circumstances (and bearing in mind that others on the same AIO cabinet with different ISPs have also noticed significant loss of performance over the same sort of hours as we are seeing) would there be any advantage in trying to find another ISP? @ GonePostal: I had near on identical experiences, though my �upgrade� date was a few days different. My speed too dropped by half (at the best of times) but a couple of days later syc increased but speeds were everywhere - OK in the day perhaps but evening just about unusable, Netflix wasn�t good at all. As I had already decided to move on as I was at the end of contract I just didn�t have sufficient patience to spend hours listening to �Daft Punk - Get Lucky� & �Rihanna� again as support was always over an hour (for me) both songs I dislike strongly but were singing them on holiday two weeks later I had heard them so much (from previous issues) - (I thought the words were lets go to a Mexican cafe) So I stuck with the rubbish speeds down to the bitter end. Phoning support late at night (after midnight) will get you quicker response, I found a guy called Kieran to be good on support. I�m not an ISP jumper having been with VM for ten years or more before Origin. Best of luck sorting your problems, keep phoning them seem to work eventually. Origin aren�t the worst ISP I have used, RedHotAnt was but they aren�t far behind. The thing is up until the last few months Origin were really good: Well for me anyway. As someone who moved to Origin's ADSL service earlier in the year I too am very unhappy. I moved from Plusnet and immediately experienced a 50% drop in sync speed and similar drop in download speed. Things did not improve during the router 'training' period either. After about a month I started getting very slow download speeds, especially in the evening, often below 1Mbit on a line which reliably gave 12Mbits with Plusnet. The ping times are very long too. Pings to Google's DNS used to be around 15ms with Plusnet but are sometimes 250ms or more with Origin and never less than 30ms. Upload speeds are very low too. Upload appears to be capped at 700kbits but rarely achieves that. Nonetheless Origin are getting away with a claim that upload is 'up to' 2Mbits - something that is utterly impossible given the cap!! On one occasion my router was unable to log-in at all for two days. My suspicion is that Origin's system is severely congested, especially at busy times. I've contacted them by phone and in numerous e-mails. The phone call was cut off and not one of my e-mails has been replied to. This company is the worst ISP I've ever had the misfortune to come across. Have you put in a formal complaint. If the service is that bad then complain and if they don't fix it then go to there Alternative Dispute Resolution provider. If it still isn't resolved then they should let you out of contract with no penalty. ADSL2+ can only manage up to 2 Mbps (technically 2.5 Mbps) if Annex M extension is used, but that is at the expense of some download speed. What could be the reason for this? why would a change in ip address fix all my issues with latency & packet loss? i have not changed any settings in my router set up, so its clearly not a problem at my end. So the cause of the high latency & packet loss on my graph is likely down to network congestion on my other ip address? Not the IP address itself, but the network that the IP address and its larger block was being routed across. Your latency graph looks very low on the bottom end. Are you sure you are pinging your IP address or one of their gateways as they use CGNAT. If you're unsure, look at what IP address your router shows you having been assigned. If the two don't match, you're NAT'd. Hmm, well they resell Vodafone broadband too - when I moved house 18 months ago I was changed from Plusnet to Vodafone as the provider Origin use. My Voda provided connection was initially OK - I continued my up to 40Mbps connection as under contract - but then regraded at contract renewal as I can sync at 70Mbps which is when everything went downhill. I now get poor single thread downloads particularly at peak - but multiple thread tests OK - but YouTuibe on my TV seems to do single thread which is often poor amongst others. Sync with exchange is super stable and I can get better single thread at "off peak" hours at times. Now they've suddenly started giving me huge bills even though I've prepaid and the customer service is diabolical - still no refunds, no call backs when promised. Oh the joys, roll on the end of contract, I'm off! Well uno has an excellent reputation on these forums for both their broadband and their customer service. Worth bearing in mind when you move. You can probably find cheaper. You could also buy the cheapest car on the market. Or the cheapest smartphone. what is NAT'd? is it a problem i need to report to Origin to fix? It's not so much the gateway you want but the WAN IP. Maybe post a traceroute to 8.8.8.8 as that should show if you're CGNAT'd. It's not a problem they may need to fix if that is the service you've agreed. They may offer IPs which you might need to pay for to avoid the NAT. So what does the above tell you? am i CGNAT'd? "We have had confirmation from our network engineers that the fault impacting your service has now been resolved. We are sorry for any inconvenience caused, and we thank you for your patience and understanding whilst we resolved this matter." I've been monitoring since then and have not seen any of the previous drops in performance during the evening and weekend periods. Fingers crossed that the problem really is resolved. Now reverted to the slow downloads and high pings. After I complained on 01/01/18 I was sent a new password and asked to reconnect but it has made no difference to the abysmal performance at the congested times of day. Mr. Saffron will be able to see the congestion issues every evening on the BQM. Are you able to jump ship? I'm waiting for a response from the CEO about leaving without penalty as I've still got about 9 months of an 18 month deal to run. I'll update when/if I get a response - and if a response isn't forthcoming we'll have to go through the whole formal complaint rigmarole. Hope it goes well, my Origin (Vodafone resold) is similarly poor but just about bearable until the end of contract. Do keep an eye on your bills if you are on supersaver - they suddenly started charging me despite being on supersaver. Not sure if he's still there but "Jay" seemed to be the customer service manager and seemed to be the only one that can get things moving. Will be voting with my feet! Ah, the unexplained mysteries of life. We had an internet drop out at about 02:45 this morning. The router remained connected and was reporting SNR, sync and max attainable speeds but we had no internet access right through the night. We noticed this morning and re-booted the router. This regained connection on a different IP with a marginal drop in sync speed. This evening the connection has been rock-solid with only a marginal speed drop and apart from one spike of packet loss no signs of congestion on the BQM. No idea whether we are on a different backhaul or whether there has been any work done on the network to take out the congestion but for today at least no complaints about the connection. Ah, the unexplained mysteries of life. The bit between birth and death? And then another internet drop-out from 23:45 last night until 00:15 this morning, reconnection on a new IP then a silent reconnection sometime between 11:45 and 20:00 today with yet another IP. The result; pings all over the place (about 3 times as long as usual on the Origin Broadband speedtest) but the achieved download speed hasn't dropped as much as previously. The new BQM I've set up since I found the silent reconnection is once again showing all the signs of congestion. I was watching a programme recently where they quoted someone. They were talking about the fact that on gravestones it could state "Here lies Mr Smith, 20 January 1945 - 15 June 2017" - the quote is that "life is the dash between birth and death" - seemed quite apt to me. Assuming he, and the complaints staff haven't already been sacked..
Also seeing high latency in the evening on my Origin FTTC connection. I am currently CGNAT'd so can't set up a BQM. I've asked for this to be removed. I'm directly with vf and see similar rubbish and variable performance too. Origin Broadband has now reverted to type on a line synced at 72Mbps. It doesn't seem (until further notice) to be a good place to be. Maybe in time they will contract sufficient bandwidth, but building a good reputation takes ages. Losing it takes minutes. (Even before the power of the net - see Gerald Ratner)). Looks like you are seeing exactly the same latency pattern on your BQM as me. I've got an open call with them but i'm not hopeful. Even when there isn't congestion the latency fluctuates quite a lot. They also told me it will take 14 days to apply a static IP to my line!